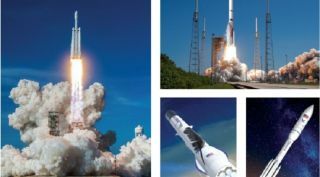 Clockwise from left: SpaceX's Falcon Heavy, ULA's Vulcan Centaur, Northrop Grumman's OmegA and Blue Origin's New Glenn rockets are all in the running to compete for a block of launch contracts the U.S. Air Force intends to divide between two providers during phase 2 of the Launch Service Agreements (LSA) program. "No decision has been made," Pentagon spokesman Lt. Col. Mike Andrews told SpaceNews on Friday. At the center of the dispute is the Air Force's decision to start evaluating proposals this year and select two suppliers in 2020 to receive Launch Service Procurement contracts. The two winners would split national security launch contracts 60/40 over a five-year period starting in 2022. Blue Origin has asked the Air Force to consider pushing the decision beyond 2020 to allow more time to evaluate newly developed rockets that won't be ready to fly until 2021. It also has argued that three, rather than two, companies should be selected for LSP Phase 2. The current plan, the company said, perpetuates the current duopoly in national security launch and puts new entrants at a disadvantage, contradicting the Air Force's own rhetoric about wanting to broaden the industrial base. Smith on Thursday sent a letter to Air Force Secretary Heather Wilson questioning "what seems to be a rush to move ahead in the procurement strategy." The Air Force, Smith wrote, is "rapidly pressing ahead with its Launch Service Procurement plan, including issuing a request for proposals in a way that risks undermining the Air Force's goal of maximizing and sustaining fair and open competition, and without sufficient information to properly evaluate next generation launch systems." "The Air Force's approach to the overall National Security Space Launch program has been concerning to this point," Smith wrote. "For instance, the plan limits the procurement to only two providers over a five-year period and terminates the LSA for the remaining launch providers, even though other launch providers might be able to successfully compete within that time frame." The Launch Service Agreements, or LSA, are cost-charing awards the Air Force made in October to Blue Origin's New Glenn ($500 million), Northrop Grumman's OmegA ($792 million) and ULA's Vulcan Centaur ($967 million) to help pay for the cost of the infrastructure and vehicle modifications that are required for commercial rockets to be certified to fly national security missions. Under the rules of the LSA program, the Air Force will cut off LSA funding to the companies that are not selected under the LSP competition to receive launch contracts. That could effectively kick the losing suppliers out of the national security launch market for good. Smith in the letter to Wilson listed other quibbles, such as the rules of the LSP competition and the schedule. "Given these concerns about maximizing fair and open competition I urge you to delay the upcoming RFP until these concerns are resolved and until there is further clarity on a path forward." He said he wants to resolve these issues "as Congress writes the FY20 National Defense Authorization Act." "I think this will be part of the NDAA fight," one source said. Whereas the Air Force is treating the LSP as a discrete procurement issue, launch companies and their congressional backers are casting it as an existential fight. During a hearing of the Senate Armed Services Committee's strategic forces subcommittee, the commander of the Air Force Space and Missile Systems Center Lt. Gen. John Thompson said ULA only has 12 RD-180 engines in inventory that can be used for national security launches awarded between now and 2022. Congress five years ago set the 2022 deadline for the Air Force to stop using the RD-180 which is the main engine of ULA's Atlas 5 rocket. "Five years ago Congress challenged us to get off the RD-180 and provide assured access to space," said Thompson. "The Air Force rose to that challenge." ULA's rivals meanwhile are convinced that the Air Force is refusing to defer the LSP selection beyond 2020 because sticking with the schedule would favor ULA as an incumbent. Sources said the RD-180 issue could become an Achilles' heel that ULA's competitors could exploit to their advantage if ULA runs out of RD-180s before its new vehicle, the Vulcan Centaur, is certified and able to replace the Atlas 5 for national security launches. The company has been promoting its recent advances in Vulcan development to ensure the vehicle is ready for its first launch in 2021. If the LSP decision were pushed out, the source said, new entrants like Blue Origin would have more time to mature their vehicles and strengthen their bids. With the RD-180 deadline looming and a limited number of engines left, ULA is in a position where "your competitors know your weakness," the source said. A delay in the LSP competition would be bad news for ULA. It would face the prospect of running out of rockets to compete unless Congress extended the RD-180 cutoff date and allowed ULA to buy more engines for the Atlas 5, the source said. "Any competitor would use that to their advantage."